A Friday evening crash with a road grader left this Osage County Sheriff’s Office vehicle in the ditch about six miles north of Lyndon. 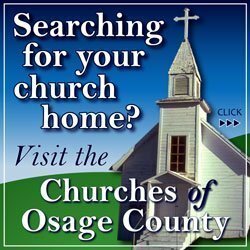 Rush hour commuters from Topeka to Osage County on U.S. Highway 75 encountered two crashes of law enforcement vehicles Friday evening – one in Shawnee County and one in Osage County. 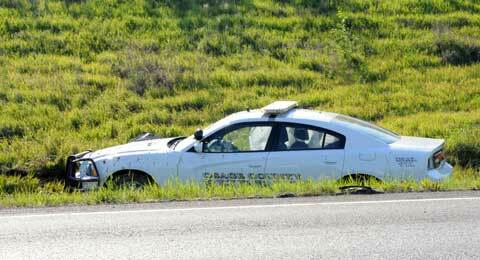 The Kansas Highway Patrol reported that KHP Trooper Natasha McCurdy, 22, Lebo, was driving southbound on U.S. 75 near Topeka about .3 miles south of Topeka Boulevard at 5:27 p.m. Friday, May 5, 2017, when she lost control of the 2016 Dodge Charger patrol car. The vehicle left the right side of the road and overturned onto its roof. McCurdy was injured in the accident and treated at the scene, but was transported to St. Francis Hospital, Topeka, to be checked. KHP reported she was wearing her seatbelt at the time of the crash. McCurdy, a trooper stationed in Osage County, received her badge in December. Further south on U.S. 75, at the intersection of 197th Street, about 6 miles north of Lyndon, shortly before the time of McCurdy’s rollover, Osage County Sheriff’s Deputy Richard Smith, 52, Lyndon, received minor injuries after his patrol car collided with a Fairfax Township road grader, driven by Charles C. Crom, 69, Lyndon. Crom was uninjured in the accident. 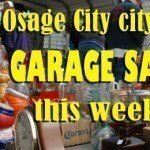 According to Osage County Sheriff Laurie Dunn, McCurdy was responding to the Osage County accident when her rollover accident occurred. 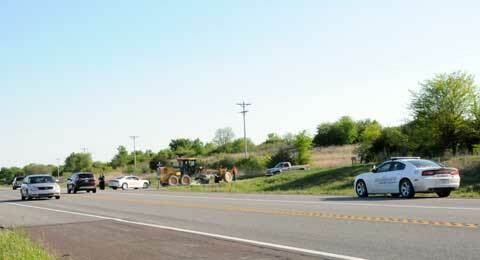 KHP Lt. Mitch Clark reported Smith was driving a 2014 Dodge Charger northbound on U.S. 75 while responding to an emergency call with lights and siren on, when he struck the road grader, which had been heading northbound partially on the shoulder, as it turned left across the highway at 197th Street. Dunn said Smith was responding to a report of an armed subject in the Four Corners area. The sheriff’s vehicle had traveled 100 feet or more north of the intersection in the west ditch, and ended up facing south on the west side of the highway. The patrol car appeared to have heavy damage on its passenger side and Dunn said it was likely a total loss. The road grader was removed from the scene on a lowboy trailer with a flat tire and unknown damages. Dunn said KHP is investigating the accident, but the crash report was not yet available as of Saturday evening. 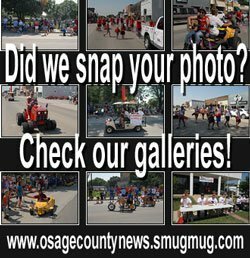 A road grader sits at the intersection of U.S. 75 and 197th Street, north of Lyndon, Friday evening, after colliding with an Osage County Sheriff’s Office vehicle. The patrol car, not pictured, ended up away from the intersection in the west ditch of the highway. Updated May 9, 2017, with grader driver’s name and grader owner information.